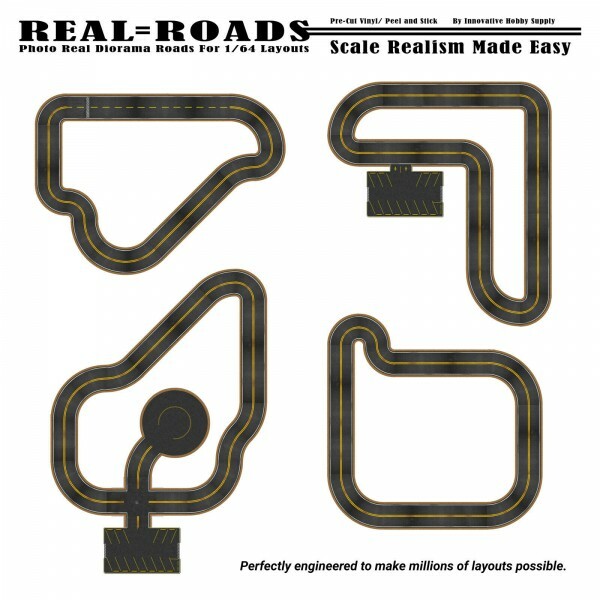 Real Roads was invented out of need for a simple way that “1/64 Scale Die Cast Fans” and collectors could create realistic roadways in a fast, yet detailed quality way. 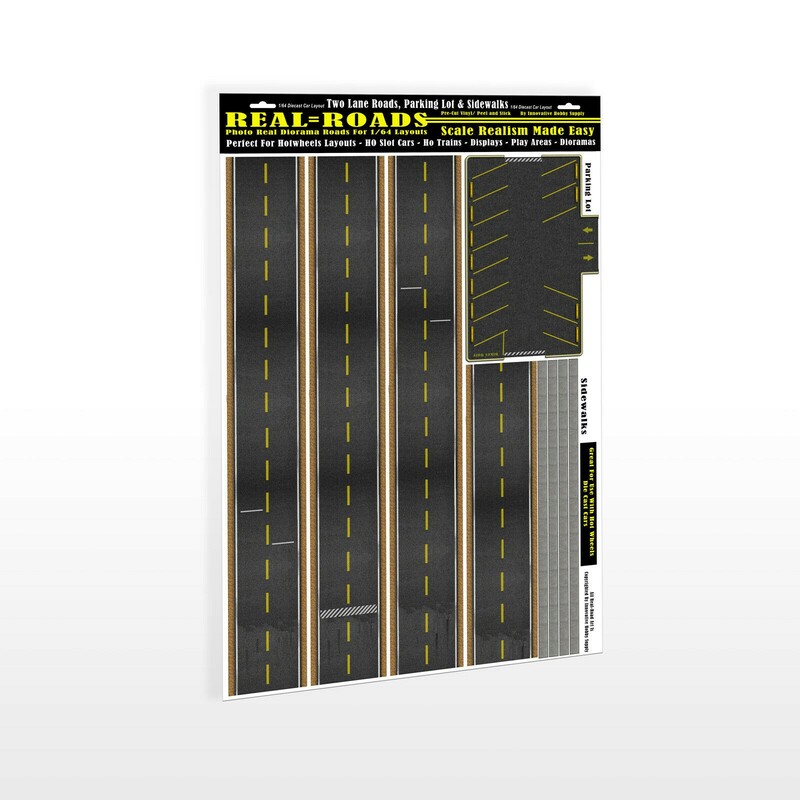 REAL ROADS is no doubt the most detailed scale roadway system you can purchase anywhere. Each REAL ROADS kit is made in the USA using a multi-step bonding process to assure a long life. They are all made with a high performance vinyl and shielded with a protective matte laminate finish that will ensure your REAL ROADS last for years to come. Huge 30 x 20 Inch Kit. REAL ROADS are 3.9 Inches wide. REAL ROADS roadway system has all the pieces you will need to make organic layouts of any size and shape and comes in a variety of different styles for all your needs. We also include pre-cut bonus sidewalks with this kit. Pick and choose only the REAL ROADS you need. REAL ROADS peel and stick sets are pre-cut for easy application onto any clean surface. Instructions and tips are included with each kit. NOTE: All product and company names are trademarks™ or registered® trademarks of their respective holders. Hot Wheels® and Matchbox® is a trademark of Mattel. Use of them does not imply any affiliation with or endorsement by them. All Rights Reserved. NOTE: All cars in the pictures are shown only for display purposes. Sorry you DO NOT get any cars with a REAL ROADS kit. Our attractive REAL ROADS should look great with any small hobby or toy car that is roughly 1/64 scale. 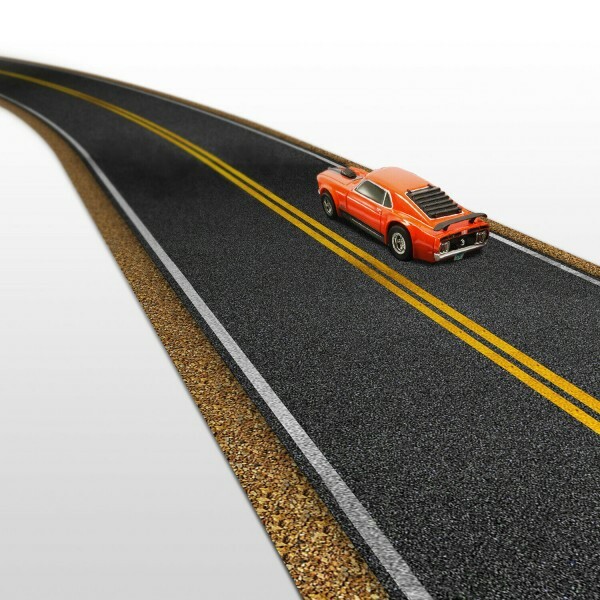 The REAL ROADS will look great with all of your Hot Wheels, Matchbox Cars, and 1/64 Slot Cars.